When I read a story or a novel and I enter its created world completely — with no outer distractions, and this mobile life we’re all living in tends to distract me even more — I cannot help but wonder at how the author pulled off the greatest trick. A terrific novel is equal to any magic trick. Rachel Ingalls is a top magician. I love rereading her mesmerizing prose. Each story is akin to being in writing class again, discovering how a Master weaves her art. I’ve been reading her stories and short novels since the early 1980s. Her first novel, Theft, won acclaim in 1970, and can be found in Something To Write Home About, gathered alongside other earlier works that I put up there with the best stories of Poe, or any other author who has a darker sensibility woven into the mundane. She writes about normal people going about their business, leading lives of want, need, and a certain immobility who stumble across something that changes them, or leaves them behind. Stan Binstead and his wife, Millie, reached London early in the morning. They both felt heavy and tired from their flight and were already weighed down by an emotion that made for even greater lassitude–a kind of inertia, intermittently broken by irritable indecisiveness. In the army they call it combat fatigue. — the first line from Binstead’s Sarfari by Rachel Ingalls. Just makes me want to figure the ins and outs of Stan and Millie. People ask me “What or who is your favorite _____?” all the time. In the pop culture world, articles about favorite books, movies, music, dance shows, fill up several articles daily. What used to keep watercooler conversations humming before the age of smart phones and DVRs has gone online. You can’t go anywhere, listen to friends during Happy Hours across the country, without the entertainment world’s best and brightest sprouting up, their personal favorites, and you’ll find these same people checking statistics, what the latest box office is, did a movie tank, on their cell phones. I have my own favorites and I love to talk about them. Today, I am recommending one of my all-time favorite authors to you. Rachel Ingalls remains somewhat of a mysterious reclusive artist since every once and again as years pass between her writing projects, a new book, or a collection of stories will finally appear. Again, as if by magic. Each new tale continues to capture my imagination and inspires me anew. I can’t read enough of the writings of Rachel Ingalls. She was born on May 13 ,1940 in Boston and raised in Cambridge, Massachusetts. After dropping out of high school at 17, Rachel travelled around Europe for two years, auditing classes at Universities in Munich and other great cities. She came back to America and enrolled at Radcliffe College, earning an English degree. In 1964 she emigrated to the United Kingdom and has lived there ever since. Rachel Ingalls won the 1970 Authors’ Club First Novel Award for Theft. 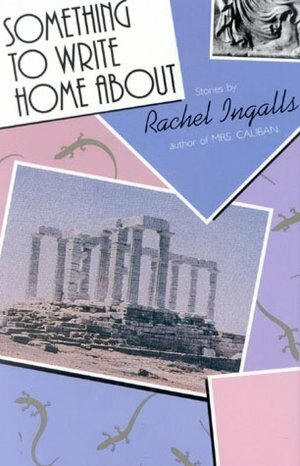 Her novel, Mrs. Caliban, was first published in 1982, and her book of short stories, Times Like These, came out in 2005. Ingall’s short story “Last Act: The Madhouse” inspired the story of the character Jean in the 1997 film Chinese Box by Wayne Wang. I remember when Mrs. Caliban was first published. This novella is a quick read at only 125 pages and despite its short length the British Book Marketing Council would name Mrs. Caliban one of the twenty best novels written by living American writers who had come of age after World War II. 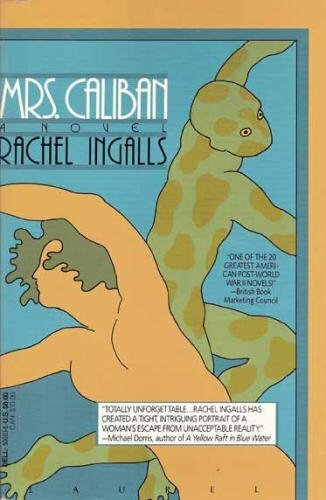 Mrs. Caliban is the unforgettable story about a California housewife’s passionate affair with a six-foot-seven creature known as Aquarius the Monsterman, whom she calls Larry. The simplicity of her prose is disarming, and many critics understood just how easy Rachel Ingalls’ made her characterizations and their interactions look. She tells a mysterious and facile story and enriches the plot with what would be a severe absurdity in a less accomplished author’s hands; I fell into a spell while reading, and believed in the core relationship. She does not waste a single word when she writes. She stopped before she knew she had stopped, and looked, without realizing that she was taking anything in. She was as surprised and shocked as if she had heard an explosion and seen her own shattered legs go flying across the floor. There was a space between him and the place where she was standing; it was like a gap in time. She saw how slowly everything was happening. Rachell Ingalls is a master of the short, sharp tales that stick in the mind decades after reading. Again, I compare her stories to Poe’s because they often go straight to the meat of a situation with an ease that belies how complex she has made the plot. I care about all of her characters and I have searched for her short novels and novellas ever since. 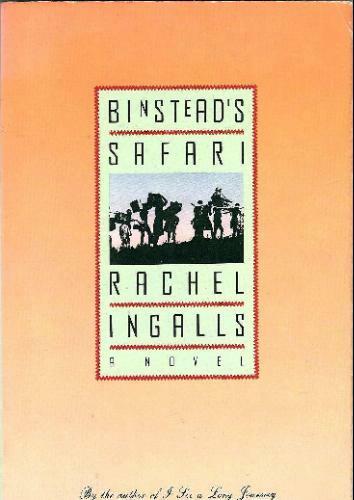 After Mrs. Caliban came her novel, Binstead’s Safari, a tale of a married couple going through more than just the motions when they travel on safari. Her best writing comes from her shorter works, and I hope you can find her books at used bookstores or buy them from your favorite online book merchant because they are gems. A few Rachel Ingalls’ books that I highly recommend along with the two novels are Be My Guest, Times Like These, and Something to Write Home About. If you like stories that end with twists that are totally unexpected, you will love all of Rachel Ingalls’ books. Try to find them and let me know what you think. Until then, I’m almost finished reading the classic historic novel of Sicily titled The Leopard by Giuseppe di Lampedusa. I tend to read the really great novels of our age very slowly, and the only novel Lampedusa wrote, qualifies as a Classic; I’m taking my time reading this lush work of art. I am also spending my time watching so many great films and I hope to share them with you next. Subscribe and Follow A Writer’s Life Blog and find me on Facebook, G+, and Twitter @JustinBog. Subscribe to the e-magazine In Classic Style and on Twitter @inclassicstyle. For all of your Apple or Mac needs and for WordPress blog design and implementation please click on Convenient Integration. M, you don’t know how happy I am right now after reading your comment; it’s not possible for you to even imagine how happy . . . but very very very happy. Thank you for dropping by once more. I hope you are having fun with your family and La Mancha isn’t chewing the sofa cushions. You are one of the lights out there I always look towards.